The Knight Rider TV show was a 60 minute action/sci-fi series on NBC about a police detective who was ambushed during a stake-out. His department believed that he had been killed but, in actuality, he survived being shot in the face and through plastic surgery had been given a new identity. A billionaire armed him with a futuristic car named K.I.T.T. with an artificial intelligence personality. It was fully armored, had x-ray sensors, flame-throwers, smoke bombs, a super sense of smell and could achieve speeds of more than 300 miles per hour! Together, he and K.I.T.T. fight against evil criminals on this terrific TV show. The premise for the TV show has interesting origins. It seems that Brandon Tartikoff felt that it was pretty difficult to find handsome male stars for the cast that could also act. He imagined a concept where the leading man would be getting out of bed with a woman and simply say, "Thank you". Then, while chasing criminals, he would simply say, "Freeze"! When the innocent victims thanked him, he'd only respond, "You're Welcome". Otherwise, the majority of the dialog would be done by a car with artificial intelligence. Luckily for us, David Hasselhoff was able to do a little bit better than that! The car's name, Kitt is an acronym for "Knight Industries Two Thousand". It was stated in one of the episodes that the car cost $11,400,000 to produce! Michael, Kitt and their support staff worked out of a huge estate called "F.L.A.G. - The Foundation For Law And Government". F.L.A.G. was originated by a dying billionaire who spent the final years of his life building the organization to fight evil and benefit mankind. Devon Miles took over his "vision" after his death. Kitt may have seemed unstopable at times but the car did have one weakness. It could not see (scan) through lead. Michael and Kitt both had "evil doubles" on Knight Rider. They were Garthe and K.A.R.R. Garthe was the son of the dying billionaire, and his face was the model for Michael's plastic surgery. Convenient, huh? 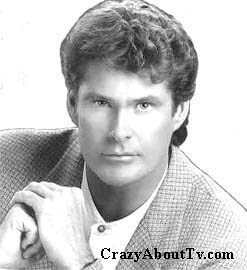 David Hasselhoff could play both parts. K.A.R.R. was built by Knight Industries just like Kitt but they forgot to include the directive to protect human life in K.A.R.R. 's programming! It was left with its primary programming being "self-preservation at all costs". By the way, K.A.R.R. stood for "Knight Automated Roving Robot" and appeared in just two episodes ... episode #9, "Trust Doesn't Rust" and episode #52, "K.I.T.T. vs. K.A.R.R. Kitt's serial number was "Aplha Delta 227529". More than 11 years after Knight Rider ended, another series titled, "Team Knight Rider" would be broadcast for one short season. It is not technically a "spin-off" of Knight Rider because no characters from this series re-appeared. Prior to receiving his new identity, Michael's last name was "Long". David Hasselhoff was a huge rock star in many countries around the world! In Germany (1989) he was selected the "Most Popular and Best Selling Artist of the Year"! He wasn't just a hero on the TV show either. In 1995 he saved a drowning child AND helped to rescue the victim of a car crash! In 1996 he finally got his star on the Hollywood Walk of Fame. Knight Rider - A shadowy flight into the dangerous world of a man who does not exist. Michael Knight, A young loner on a crusade to champion the cause of the innocent, the helpless, the powerless, in a world of criminals who operate above the law. One man can make a difference, Michael. Michael Knight. A Lone crusader in a dangerous world. The World, of the Knight Rider. Michael Knight. A Lone crusader in a dangerous world. The World, of the Knight Rider. Thank you for visiting our Knight Rider TV Show page!